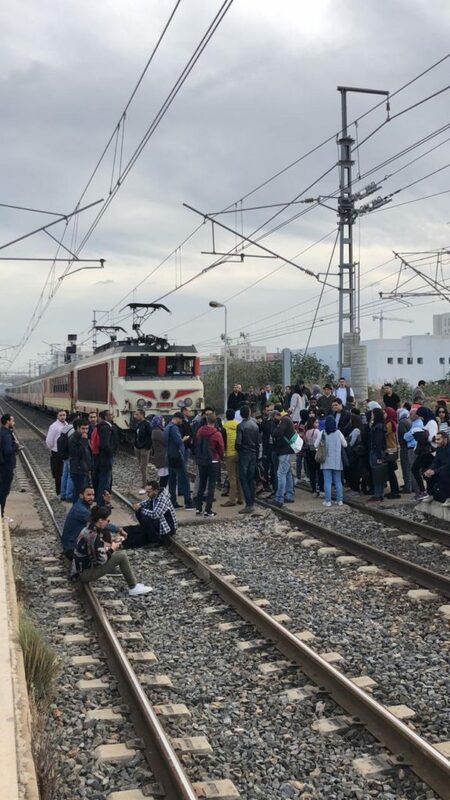 Growing frustration over continued train delays has prompted Moroccans to block the tracks at Temara train station, just south of Rabat, on Friday. Rabat – Growing frustration over continued train delays has prompted Moroccans to block the tracks at Temara train station, just south of Rabat, on Friday. Travelers say they were waiting for their train for three hours in Temara, beginning at 7 a.m. 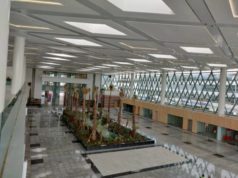 Angry protesters said that the train line between Casablanca and Kenitra has experienced constant delays, causing travelers to be late for their work. 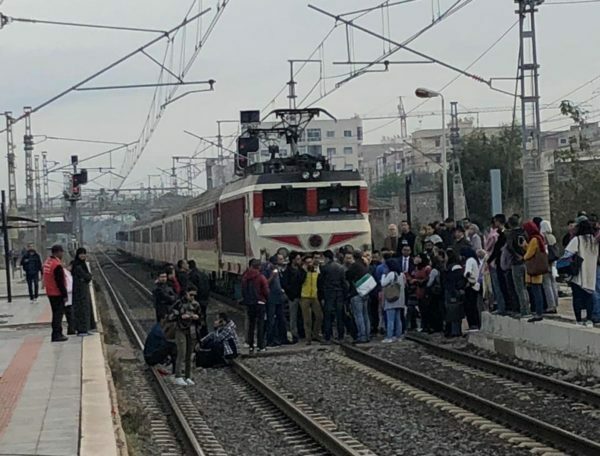 The man said that instead of explaining the situation to people, the National Office of Railways (ONCF), Morocco’s only rail transport provider, called the police, who showed up with clubs, “intimidating” and pushing people around and even arresting some of the protesters. Police also confiscated one young woman’s phone as she was recording the protest. Train passengers are demanding explanations from higher-ups at the company and asking for immediate solutions. 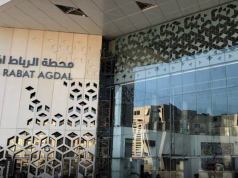 Another traveler coming from Casablanca to Rabat told MWN that the train stopped in Mohammedia for five minutes, and when people called ONCF’s “2255” customer service line, it was not available. Protesters left the Temara train station at 11 a.m. and trains are now running again for time being. ONCF released a statement on Twitter three hours before the protests ended in Temara, claiming that security forces handled the situation. Protests against ONCF train delays have sprouted occasionally for years. But the Temara protest comes just 10 days after the Bouknadel train accident on October 16. 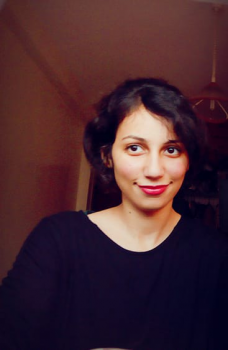 Last week, Moroccans called for a boycott of ONCF, blaming it for the accident. However, the controversy following the accident has subdued. With today’s protest, will Moroccans consider a serious boycott against the country’s only railway company? 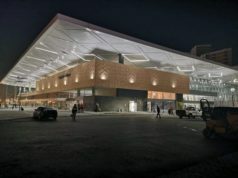 At the same time, Morocco’s high speed train, the LGV, is expected to be operational by the end of 2018. The train No. 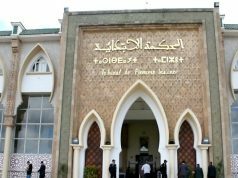 9 linking Rabat and Kenitra on the Casablanca-Kenitra line derailed near Bouknadel on Tuesday, October 16, at 10:20 a.m., killing 7 and injuring 125. The tragic accident shook the country and made international headlines. The cause of the derailment, according to the investigation, was speeding. 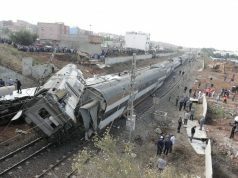 The public prosecutor of Sale’s Court of First Instance blamed the driver for going 158 kilometers per hour when the speed limit on the stretch of track where the train derailed was only 60 kilometers per hour. 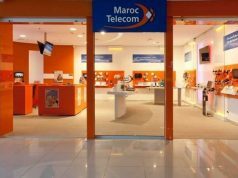 Moroccans put the blame on ONCF after a recording of a conversation between ONCF employees went viral. The recording said that faulty tracks and absence of speed-limit signs caused the accident.